All good things must come to an end. With the launch of the Intel DN2800MT “Marshalltown” Thin Mini-ITX motherboard, we knew it was only a matter of time until its predecessor, the Intel D945GSEJT “Johnstown” would be put out to pasture. Pack your bags, Johnstown, there’s a new mobo in town. Intel’s official End-of-Life (EOL) announcement for the board came back in March with the last time buy date set for April 2, 2012. We secured enough boards for our customers plus some additional stock just to keep on hand. However, we recommend that customers begin to migrate to new platforms because availability will likely get spotty in the coming months. So what are the remaining options? Obviously there’s the Intel DN2800MT, Intel’s direct successor to the D945GSEJT, all handsomely beefed up with its dual core processor and native HD graphics support. Or there’s the Jetway NF95A-270, which runs off the same Intel N270 processor like the D945GSEJT. Like the good friend you’ve known since kindergarten but could never consider in “that way,” the NF95A is a predictable fallback. It will answer your call no matter what, offering a sympathetic ear in which to gripe. Like that time when you learned the DN2800MT wasn’t going to support Linux out of the box; you can bet the NF95A was running Linux all along. 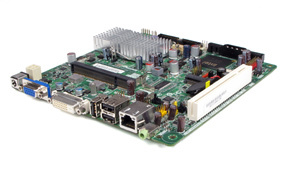 But what are the technical differences between the D945GSEJT and its fellow Thin Mini-ITX migration options? Well, consider the table below speed dating for motherboards. I hope people find it handy. Slots, Capacity 1x slot, 2 GB max. 1x slot, 2 GB max. 2 x slots, 4 GB max. 1x slot, 2 GB max. Also, for systems designed around the Intel DN2800MT, we offer the Logic Supply AG150 Fanless Computer. Similar in size and functionality to our very popular SolidLogic Atom JT01 that features the Intel D945GSEJT, the AG150 sets itself apart with dual-core performance, the ability to support two storage devices, and native 1080p graphics. I am posting this from a DN2800MT running slackware. What is interesting is that the DN2800MT resembles the DH61AG, but the barrel connector for the DN2800MT is compatible with the power bricks sold at LS, and the barrel connector of the DH61AG is not compatible. Lucky for me, I happen to own exactly the Compaq laptop with the 65-watt power brick and a barrel connector that does fit the DH61AG. Too bad LS hasn’t found a barrel-to-barrel connector that goes between their standard power brick and the DH61AG. I am writing this because, the DN2800MT runs roughly 15 to 18 watts, power brick and all, in operation, while the DH61AG runs at most 28 watts with the single-core Sandybridge celeron inside. It also does html5 video twice as fast as the DN2800MT. In other words, low-end Sandybridge celerons are the next step in power consumption and capability over Intel and AMD atoms. What else is interesting is that the DH61AG has an overclocking bios that promises to handle the Ivybridge devices alongside the Sandybridge, with the 65-watt maximum. In other words, the bios says I can overclock my single-core celeron to 35 watts for one second if I want to (I don’t).